i had some breakable glasses wrapped in the tea towel above for the trip home. the glasses are cheery ones from the 50s - with a pink check and a gold rim. 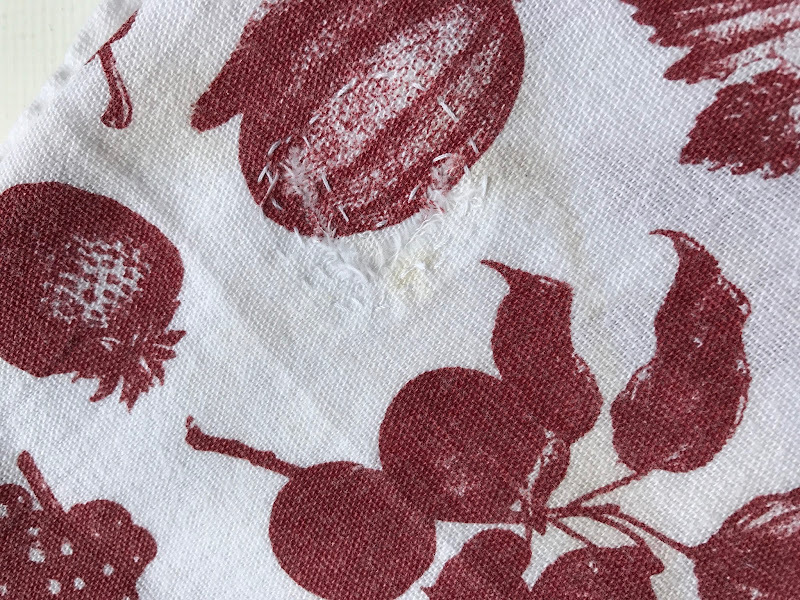 i didn't notice that this tea towel had a careful hand-stitched repair of a hole until i went to iron it yesterday. and i welled up. mom must have sat down with it and carefully stitched a fine little oval-shaped patch into place. i find myself wondering when she did it. she couldn't have done it today. she's losing her words for things like needles and thread and while her fingers might remember how to make careful stitches, i'm not certain her mind could any longer make the connections necessary to do so. what made this particular towel worthy of repair? it is a nice, soft towel of the kind that are hard to find these days - the kind that actually absorbs water and which is soft enough to clean your glasses on and have them end up clean. that's part of why i used it to wrap up the glasses, i knew i would appreciate using it when i got home. mom's house is full of objects and we donated, gave away, threw away and burned a great many of them. but there were things here and there that i wanted to save and take home - like these glasses and this tea towel. i'm not sure what to make of my choices. i don't particularly remember the glasses from my childhood. i think they are something she collected at a flea market in the years after i left home, so there aren't memories attached to them. but still, they spark joy (a factor my sister swears by after reading the marie kondo book). and it means something to have brought them home with me, across half a continent and an ocean. i feel comforted when i use them. speaking of memory and objects, matisse found joy in things as well. an interesting piece on alzheimer's as a women's issue in the lenny letter. Two things happened to us lately.My mum had a double stroke and is in a rehabilitation centre.I had my flat painted and realised we have far too many things around to breathe.Looking at my mum's flat empty of her presence till she returns(?) and all her things waiting for her, most of which have no meaning to me or her grandchildren I simply understand that we have to let go of things. What happens when too many of the things around us bring us happiness?What happens to our things when we are gone?They are thrown away,given,donated,etc. So I have to let go of things earlier than I had thought.AriadneformGreece! I have a garlic crusher I picked up at my grandfather's house as we were gathering all the last bits and pieces to take to the charity shop - after all the furniture and artworks and family memorabilia had been distributed. I use it weekly and always think so fondly of him when I do. The silly thing is my grandfather never cooked, probably never handled the thing and it most likely came to their house via my step-grandmother who I was not so fond of. But it's old-fashioned, well-made, sensible and strong - he would have liked it had he even considered such things - and it distinctly reminds me of him. Things are so much more linked to emotions than we give them credit for I think, little things like garlic crushers and tea towels. @Ariadne - I'm sorry to hear about your mother. I too look around my own house and realize we have far too many things. I'm taking a week off at the end of the month and I'm going to do a major purge! Hopefully donating many things and selling things that are useful and being ruthless about what stays and what goes. @Molly - I love the garlic crusher. I wonder if it's just in as humans to ascribe meaning to things. And form emotional attachments. I've got rocks on my windowsill that I love - how does that happen?